The cost of a hearing device is not generally dependent on its shape or size. The level of technology will determine its cost and can vary greatly from product to product. Just because two instruments look alike, doesn't mean they offer the same level of help for the end user. Even two aids from the same manufacturer can be levels, and years apart. This also means that it's very possible that you will be able to wear the style you like. The two main factors that go into choosing the correct level of technology are lifestyle and budget. Sometimes these factors conflict with one another. For example, a client may have a low budget, but live an extremely active life. Education with the combined guidance of an experienced hearing healthcare professional, lead to the best possible solution. 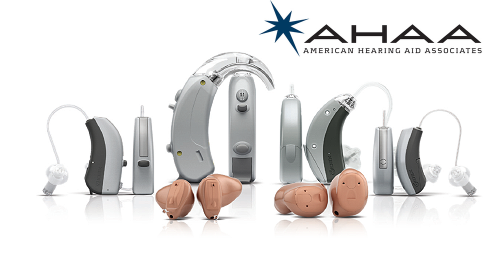 Complete Hearing Health Care is our comprehensive service package included in the price of the hearing device you choose. The program comes from a national association of hearing healthcare providers pieced together by American Hearing Aid Associates. AHAA, and its thousands of clinicians across the country, insures that when you are near one, you will receive the same quality service at no charge. Return Policy: New Life Hearing guarantees that clients will be satisfied with their purchase. Hearing improvement never reaches perfection or "normal hearing". In the event that a client wants to return the instrument(s), a refund will be issued in the original format in which it was paid. The hearing aid(s) must be returned in good condition, within the agreed upon Trial Period (typically 30 Days). A $100 per instrument fitting fee will be retained unless otherwise agreed upon.